In an effort to increase user engagement and encourage exploration Foursquare has revamped its badge system and will introduce leveling up based on check-ins. Foursquare is a location-based social networking service for mobile devices that allows individuals to check in at venues and earn rewards in the form of badges – which range from habits to brands that the the company has partnered with. 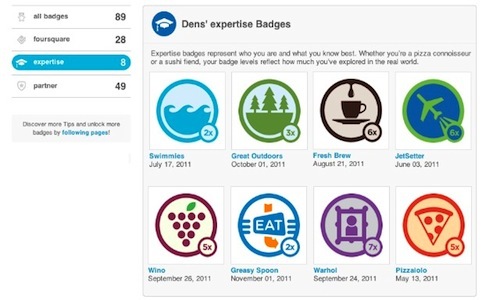 For some users, motivation behind checking in was to collect a Foursquare badge. However, once the badge was collected, there was little reason to continue checking in to venues related to the badge. 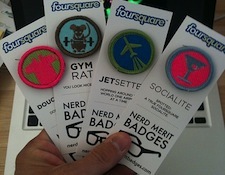 As of today, Foursquare’s core category badges will begin leveling up based on users’ check-ins. A numerical icon will appear on the bottom right of the badge and will indicate how often that individual has checked in to places related to the badge. “It’s rewarding exploration and awarding expertise,” explains Alex Rainert, Foursquare’s Head of Product. “It’s a platform to showcase tastemakers and get their content exposed.” The theory is that a person with a high-level badge is more likely to give better tips – advice given through the app, not money – than someone with a low-level badge. To reach level one, users must check in five times to places in within a badge category. It can also be unlocked by checking in to three unique places. To continue leveling up, users will have to check in to five unique places related to that category. The highest an individual can go is 10 levels, which is 48 check-ins. The idea is now that in addition to wanting to collect badge, consumers will want to level up and show off expertise in a certain area. As a business, this could draw in more customers, but it could also result in some great feedback as more customers share tips for other Foursquare users.